In this inteview, Steve Aoki gives us a look to the main gear he use to produce records in both of his studios : The ''Neon Future Cave'' in Las Vegas, NV and the ''Dim Mak Studio'' in Los Angeles, CA. > There are a lot of mics that I used in the past but I have just got the microphone of all microphones, the Sony C800G. That’s the one I had been looking for and it’s been really difficult to get. > All the new stuff was with the Sony C800G. That’s a vintage tube mic that sounds incredible. It’s definitely one of the highest-level mics in the game, there’s no doubt about that. And it looks sick. It’s just this dope, futuristic looking mic, which is perfect for my studio. "[Kendrick]'s also had a studio in his tour bus ever since we were on tour for the first album. If he didn’t have that, he’d be recording in GarageBand! So we made it easier for him, and set up this studio in the bus, with a simple setup, consisting of a Pro Tools HD rack, two mics, the Sony C800G and a Telefunken U47 and an Avalon mic pre. Nothing crazy, just stuff that allows us to get down ideas"
"We record on a Sony C-800 surrounded by a tent of blankets in a sound-proofed closet inside a live/work loft in Chicago." In this clip Lil Wayne is in the studio recording his vocals for "I Don't Know How Fake Feel" he is using a Sony C800G (time stamp 0:32s). A Sound On Sound article from October 2010 talks about the recording process for Eminem's 2010 album [Recovery](http://en.wikipedia.org/wiki/Recovery_%28Eminem_album%29). 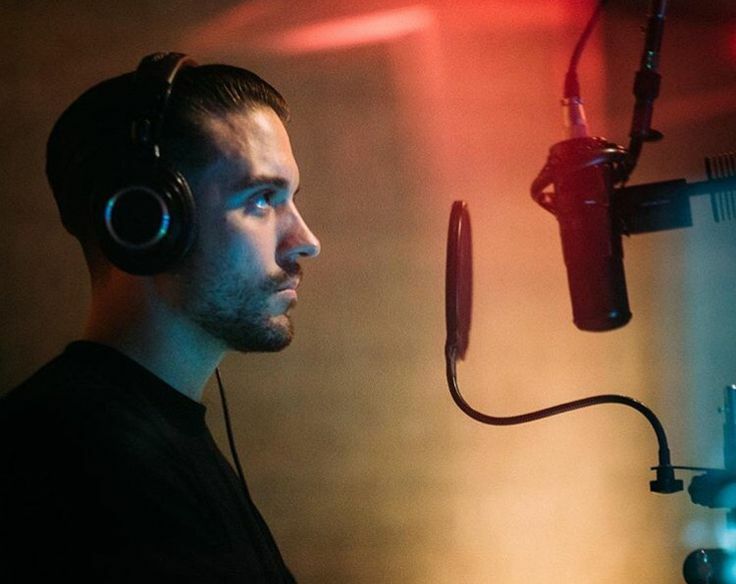 Eminem's recording engineer Mike Strange talks about the vocal mic Eminem prefers to record with in the studio: " "We have a large live room at Effigy, and we have Em in there with some gobos, and a Sony C800 microphone, going into an [Avalon 737 mic pre](http://equipboard.com/items/avalon-vt-737sp-mic-preamp). It's the microphone that [Dre](http://equipboard.com/pros/dr-dre) uses, and Em likes it, so he's always used it. In all the years I've worked with him, I don't think we've ever tried another mic. It's a little bit like a guitar player who digs his old Les Paul: you don't take that away from him. We have a few C800 mics, because we tend to burn them up quite quickly. Em has two, I have one, and Luis has two or three. Because it's a fairly modern mic we've never had problems changing from one to another." Original article link [here](http://www.soundonsound.com/sos/oct10/articles/it-1010.htm). In this performance by Rihanna, she uses the Sony C-800G for recording her voice. Microphone can be seen at 0:34. Quavo spotted using the c-800g in the second photo of this series of photos on Travis Scott's instagram. Britney used the C-800G on two tracks on Circus, according to Andy Page, the co-producer: > "I recorded/engineered/programmed/mixed 2 songs from "Circus", "Out from Under" and "My Baby", both produced by Guy Sigsworth. The vocal chain was a C800G going in to an Avalon 737, then straight into ProTools via a 192." In diesem Video sieht man Kollegah bei 2:24 das Sony C-800G benutzen. 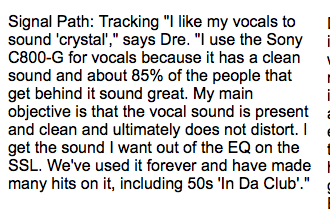 In [this article](http://www.avalondesign.com/testsite/news_090305.html), it quotes Dr. Dre saying, "I like my vocals to sound 'crystal.' I use the Sony C800-G for vocals because it has a clean sound and about 85% of the people that get behind it sound great. My main objective is that the vocal sound is present and clean and ultimately does not distort. I get the sound I want out of the EQ on the SSL. We've used it forever and have made many hits on it, including 50s 'In Da Club'." None about the recording equipment! 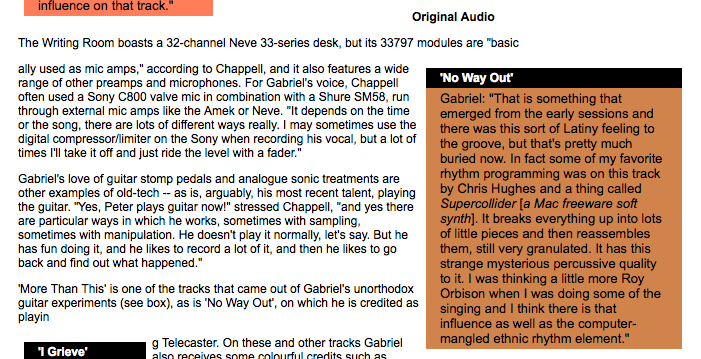 "For Gabriel's voice, Chappell often used a Sony C800 valve mic in combination with a Shure SM58, run through external mic amps like the Amek or Neve," [this article](http://www.soundonsound.com/sos/may03/articles/gabrielchappell.asp) states. Spotted a Sony C-800G in this photo. > “The mics were a combination of Sony C800G and Rode NT2,” he adds. “About 60 percent of the vox were on the Rode. Aaron Carter can be seen recording with a Sony c800g in his Instagram post. Throughout this whole video you can see Ja Rule recording on Sony c-800G tube microphone. McMorrow posted this on Instagram during the recording sessions for his third album. While recording with Dr.Dre, Anderson .Paak uses a Sony C-800G. Can be seen at 3:00.
the mic is seen in the background of this video. At 0:39. Chief Keef can be seen recording vocals on a Sony C-800G Microphone at Interscope Records. The microphone is also listed at Interscope Studio's official website. Electronic Musician lists a Sony C800G microphone as part of Guy Sigsworth's kit list at the end of the article. "SONY C800g good good good!!"